As a student at the University of Leiden, with George Uhlenbeck he postulated in 1925 the idea of electron spin, though he admits it took some time to realize this because he considered himself "not a very good physicist." 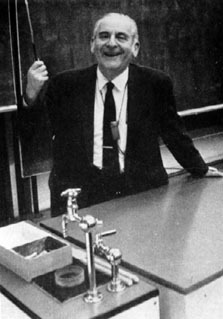 After completing his education in Europe Goudsmit emigrated to the United States in 1927 and took a professorship at the University of Michigan. During WWII he performed research at the MIT Radiation Laboratory, but most importantly served as the chief of the ALSOS group for the Manhattan Project, charged with assessing the German ability to build an atomic bomb. Goudsmit later served on the staff of Brookhaven National Laboratory, from 1948 to 1970.